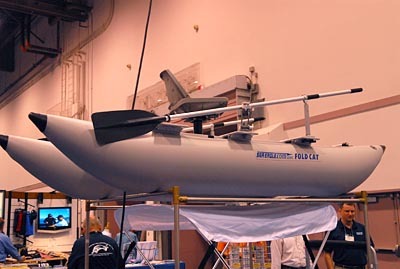 Sea Eagle: Last year at ICAST was the first time we saw the two person Sea Eagle FoldCat. Since then Sea Eagle introduced a few useful accessories for the FoldCat that we were able to see in person, but there�s one new accessory that we must feature here, that�s the Casting Bar. When we originally conducted our in-depth review on the FoldCat we found it to be already incredibly stable to stand up and fish on. But now add in the security of the casting bar and you can stand up to fish even when the water is not as nice or when those bigger boats cruise by. 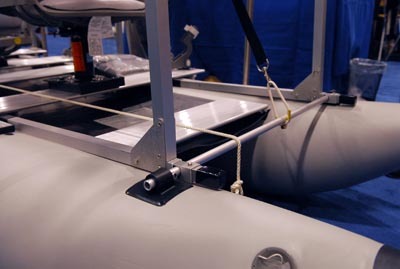 The entire assembly is made of aluminum and is secured onto the FoldCat seamlessly. 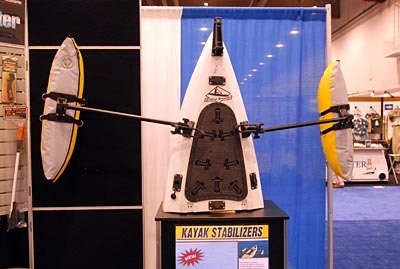 Now, the original FoldCat 375fc only came in a two person model but this year at ICAST we saw the introduction of a single person FoldCat. The new 325fc FoldCat makes use of the same design and materials as the 375fc, so the stability and performance should be similar but this model should be lighter and easier for one person to carry. The new FoldCat will be available around October and will retail for about $1000 depending on what fishing package you choose. 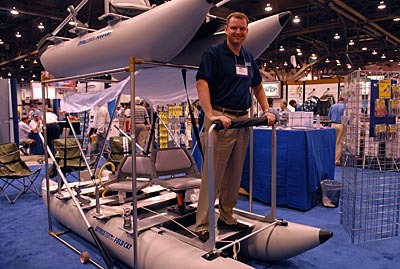 Scotty: If you own any type of watercraft, then you know what Scotty products are all about. 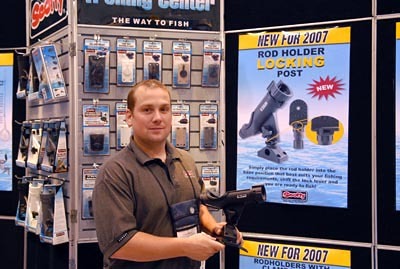 They are well known for their downriggers, rod holders, and much more. This year we saw a few exciting new products from Scotty that we thought anglers might be interested in. 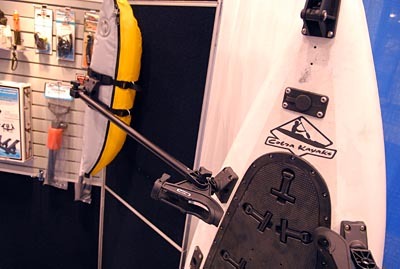 First for kayak, inflatable, and canoe anglers, Scotty introduced their Stabilizer system to gives you a more secure and steady platform to fish off of. The Scotty Stabilizer uses inflatable bladders that are protected via a thick PVC outer material that offer over 30 pounds of extra buoyancy. With most Scotty products they make use of their quick in and out system. 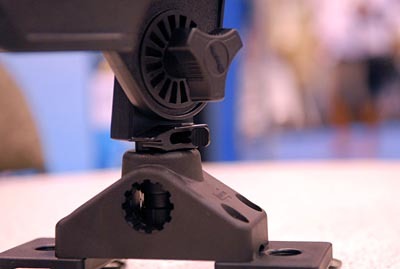 The Stabilizer utilizes Scotty�s new Locking Posts which makes installation and removal quick and easy. The Stabilizers will be available in the late Fall and will retail for $399. Speaking of Locking Posts this is something new from Scotty that�ll make rod holder more secure and angle adjustment much easier. Scotty has a new rod holder Locking Post that is engaged and disengaged simply by flipping a switch on the post. Remember before how you had to lift the rod holder to a certain level before you can rotate it, then set it back down to lock it, well, that�s no more with the Locking Post. The Posts cost $6.99 each and all you have to do is replace your current post with the Locking Post and you�ll have this added feature. Availability will be around October of this year. Every angler needs a beverage holder for water, soda, or beer. Scotty has a Drink Holder for you that will utilize the existing rod holder base. 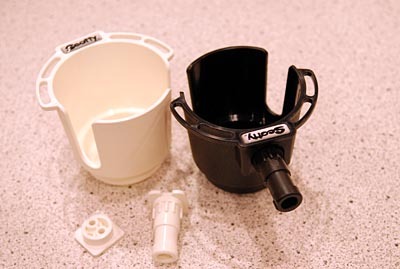 The new Scotty cup holders come in white or black and can be mounted from the side or bottom. When you�re not using it to hold that cold beverage you can use it for tools, lures, and other tackle. The Scotty holders can be bought in late Fall for $11.99 to $15.99.